(Bloomberg) -- Bond traders have a decent record when it comes to nailing the Federal Reserve’s path relative to official guidance. So while Chairman Jerome Powell says the policy rate is “in a good place,” history suggests his next move could align with what futures are showing -- a rate cut. The central bank held the target range for the federal funds rate at 2.25 percent to 2.5 percent, while signaling no change in rates this year and one hike in 2020. Officials also decided to slow the drawdown of the central bank’s bond holdings starting in May, then end it in September. “The data are not currently sending a signal that we need to move in one direction or another,” Powell said in response to a reporter’s query about the market pricing a cut as most likely. “We see a favorable outlook for this year,” Powell said, with policy makers expecting growth at around 2 percent, unemployment under 4 percent and inflation close to target. “But we are also very mindful of the risks,” including slowing global growth, trade tension and Brexit, he said. Gautam Khanna, senior portfolio manager at Insight Investment Management, aligns more with Powell and doesn’t share the bond market’s gloomy view on the economy. “I don’t buy into that,” he said. While he said he’s “surprised by the market reaction,” he’s also wary of taking an opposing stance at this point, and is neutral duration in portfolios. With Treasury rates out to around five years now below the fed funds rate, Wednesday’s bond rally raises questions about where value is in the curve, in Khanna’s view. The 10-year Treasury yield dipped below 2.5 percent Thursday, its lowest since January 2018. TD Securities strategists including Michael Hanson lowered their forecasts for yields after the Fed decision, to 2.6 percent for the 10-year at year-end, from 2.85 percent previously. 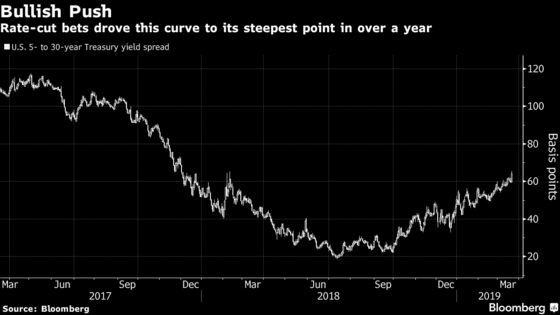 In another sign of building expectations for rate cuts, the spread between 5- and 30-year yields touched 66 basis points Wednesday, the widest in more than a year.